An e-mail went out this afternoon to those who inquired with Los Angeles City Attorney Rocky Delgadillo's office regarding the possible termination of Beyond Baroque's tenancy at a city-owned building in Venice [see previous post here]. The gist: Don't call us. Call Council Member Bill Rosendahl. "The City Attorney's Office does not set or control policy in leasing matters." Also this week, Beyond Baroque's executive director, Fred Dewey, sent an e-mail to supporters that described the situation as being "down to the wire," with the non-profit's lease set to expire Saturday, March 1. "We are a national institution caught in LA indifference." 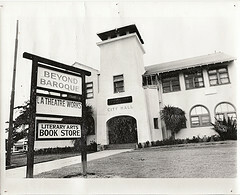 The only place the LA Times has made mention of the Beyond Baroque matter is online, at the newspaper's new LA Now blog. But it's hardly been the only local literary news missed this week by print-side reporters at The Times. 1. An online roundup mention at LA Now [which had to link to a Reuters story because there was no staff byline to be had]. 2. An online item at the LAT's Opinion LA blog, which had the temerity to claim partial credit for the achievement, saying that its editorial board "along with local activists, scored a victory." 2. A guest column by author TC Boyle. 3. A post at the LAT's LA Now blog. 4. A mention at the LAT's Opinion LA blog. 5. A blog post from LAT columnist Steve Lopez. Perhaps the lesson is to not expect proper coverage until you're dead. Or, maybe, to die in Brentwood. Not sure. Text of the e-mails from the City Attorney's office and Dewey follow. Thank you for your recent e-mail expressing your support for the City's extension of the lease of City property to Beyond Baroque. We applaud the wonderful work that this organization performs for our City residents, and wish to make clear that the City Attorney's Office is not in any way prohibiting the City from continuing its long-standing relationship with Beyond Baroque. The City Council and Mayor are responsible for decisions to lease City property. The City Attorney's Office's role in these matters is solely to approve the form of the lease and to advise City officials regarding applicable laws. The City Attorney's Office does not set or control policy in leasing matters. We understand that Council Member Rosendahl has recommended to the City Council that the City's lease with Beyond Baroque be extended. If you have questions about the Council Member's motion or the Council process going forward, you may wish to speak with his office. Again, thank you for taking the time to send your e-mail. I am sending this email to those I know pretty well (and have emails for), to family, friends, and colleagues, to fill you in on the current situation on the fate of Beyond Baroque, a cultural institution I have worked for the last 12 years, with many others, to build up, here in Los Angeles. Its lease is now in question, and ends Saturday, March 1st. It has not been extended. Obviously, I take this very much to heart, so I am trying to get the word out. Some of you have weighed in, others might just like to know what is happening. Like so many American non-profit stories, this has that unfortunate crisis ring. Nonetheless, Beyond Baroque must be protected. I and a good team of people have been working hard on this, but things are down to the wire. We are a national institution caught in LA indifference. If you know anyone in the national press, please pass the [*] article on. I believe the facts to be solid, tho the tone is hardly poetic, and the problem somewhat obscure. But Beyond Baroque is an amazing, forty-year institution, with an extraordinary list of accomplishments, free workshops, publications, readings and so on. It has nurtured so many. But our lease is up Saturday, and we will go month to month, with unforeseen consequences. it is possible things will all be worked out in the next few days. We have worked very hard, for almost five years, to make sure of that. I have listed two key emails below, for those among you who have NOT already gotten emails. cc me if you send something. Updates are on our website, at beyondbaroque.org, and on my space. There is nothing like Beyond Baroque anywhere else in America; it is dedicated to the power of language, meaning, and public space, in the struggle to protect all our precious freedoms and capacities. We will prevail.